Time for a bit of DIY Aga servicing. 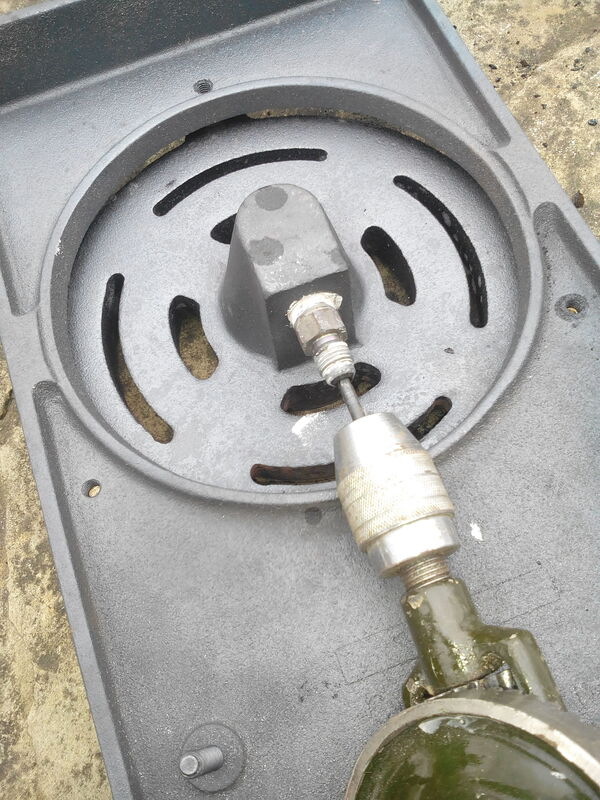 Some years ago I was taught how to service our oil Aga by a friendly, Austin Seven driving, ex-Aga installer. The process, once you know it, isn’t complicated, but it does cost over £100 these days to have someone come and do it for you. This is made worse by the fact that oil is apparently getting dirtier, so a once or twice a year service now needs doing two or three times a year. 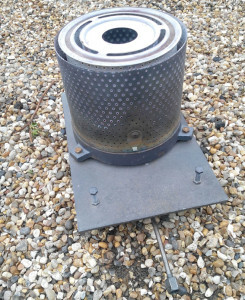 The first picture is the heater unit in the Aga. 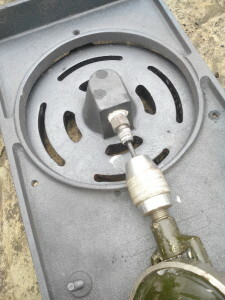 Simply switch off the oil supply, undo the oil supply pipe, and remove the unit. 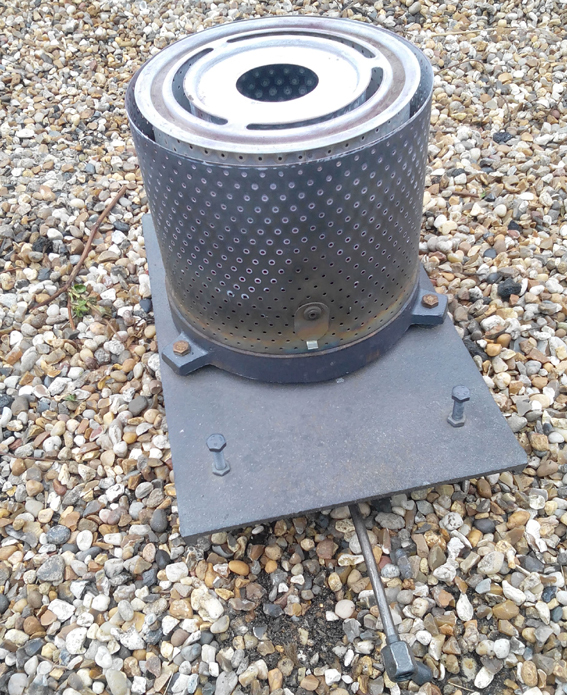 The second picture is of the burner outside and the third shows the underside. The oil supply pipe has been removed and a drill is used to clean through to the burner reservoir. 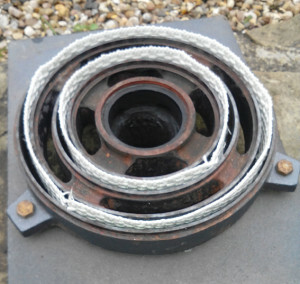 The next picture below shows the oil well and wicks, of which there are two. There is a crusting of oil residue in the well. I try to service the burner when it is like this, mildly crusted. 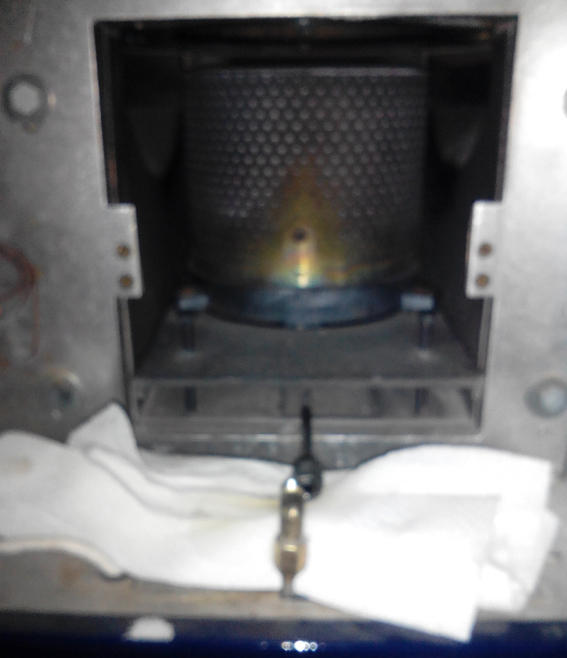 I have however, missed a servicing in the past and found the well crusted solid with almost no space for the oil to flow. 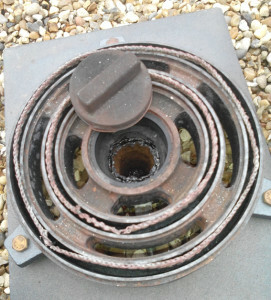 The second picture shows the amount of residue scraped out from the reservoir. The third is of new wicks. I replace the wicks every 4 years or so and it was time. A simple clean of the baffles with a wire brush later and the job is done. Unfortunately, I forgot to take a picture of the cylindrical baffles being cleaned, but they are basically just metal perforated tubes. Push them back in place and the unit is read to go back into the Aga. Switch the oil back on and leave for about an hour, to make sure that the oil has soaked the new wicks, and it is ready to light. So that’s about 30 minutes for the service, an hour of waiting time, and £100 saved. This post comes with all usual disclaimers. 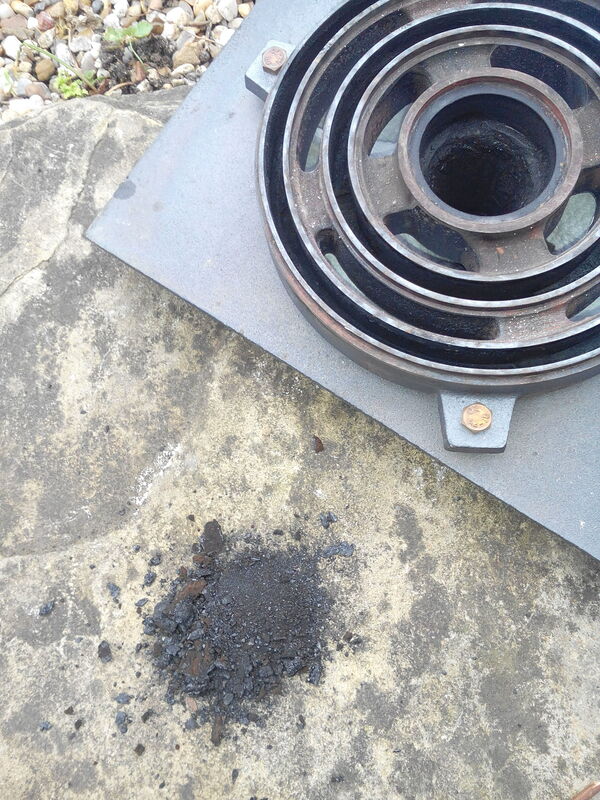 It is not a complete guide to servicing an oil Aga burner, rather the highlights of how I do it. I wouldn’t have done this without the opportunity to watch a qualified Aga engineer do it first, and neither should you. 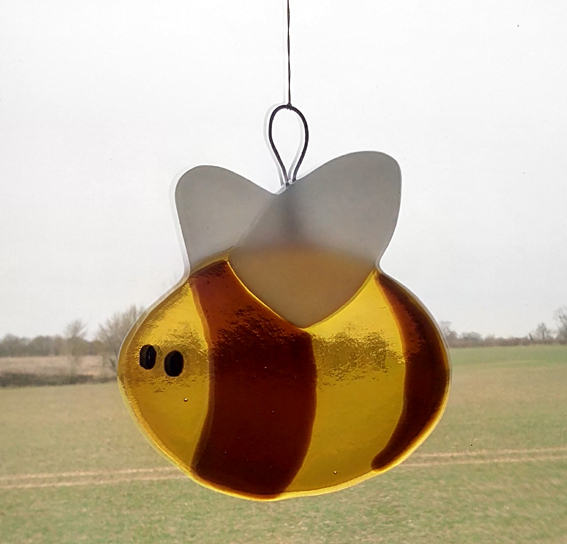 We are now offering our first fused glass suncatcher bees for sale. They are hand made in our own kiln and I have only 6 available for sale. They are therefore already RARE. 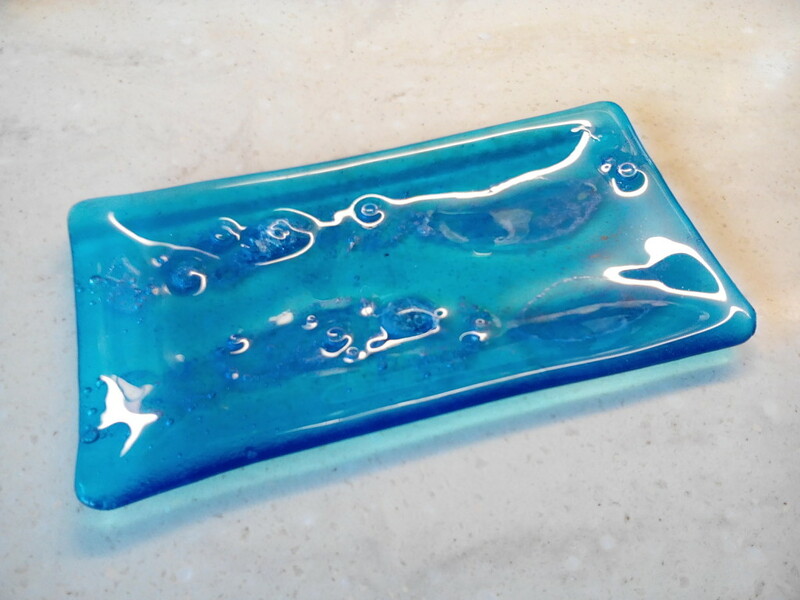 They are approximately 10cm x 10cm and are made from coloured fused glass. They have a copper ring so that they can be hung in a window as a traditional suncatcher. Please contact me at sales@andybennettuk.co.uk if you would like to buy one. 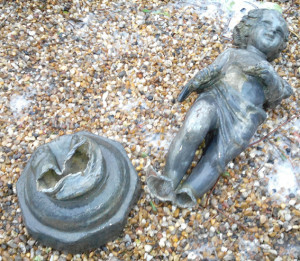 I was asked if I could repair a lead garden statue. I have experience in leaded glass window work and blacksmithing, so was confident I could help. 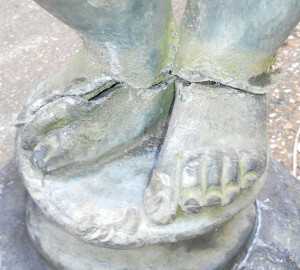 If it isn’t obvious, this picture is of the repaired statue. Read on to see how I got there. 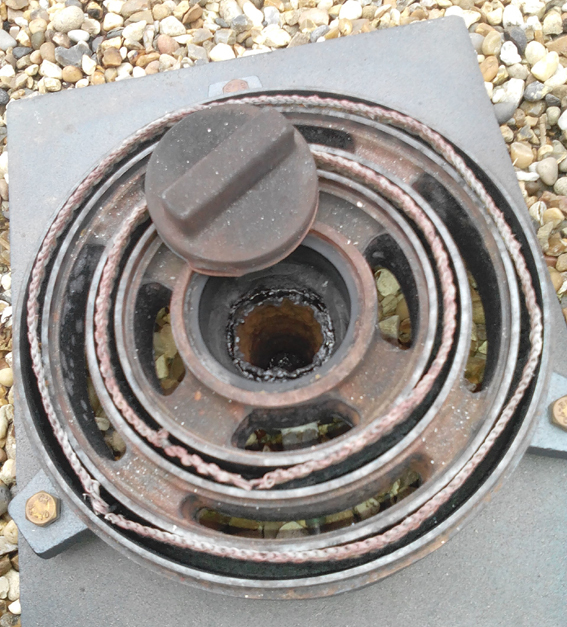 The first problem I faced was that stressed lead crumbles. It literally falls apart in your fingers and is impossible to solder or melt. But let’s start at the beginning, with what it looked like when I collected it. To be honest I am not surprised it failed at the ankles. 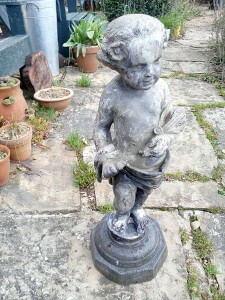 The statue is about 2 foot tall and, given it is made of lead, is obviously heavy. All that weight and leverage going through a relatively thin wall at the ankle is never going to last the distance. 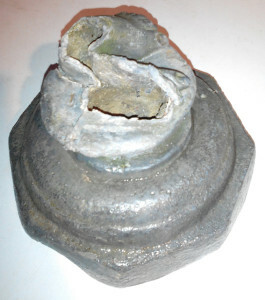 The break wasn’t clean, it had twisted and ripped apart, distorting the base in the process. 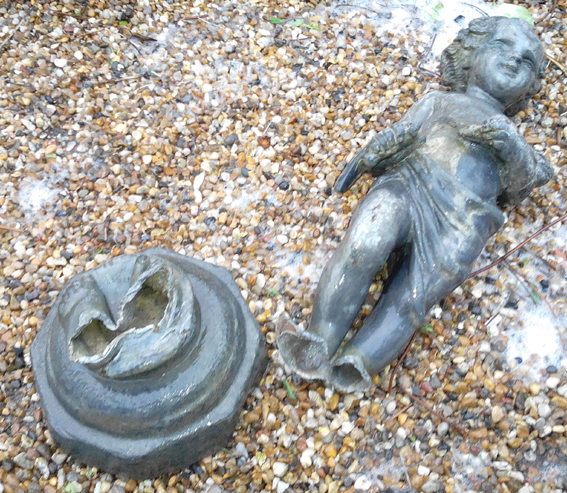 I was now ready to begin to refit the statue. A lot of jiggling around, cleaning back of flaking lead bits, bending of lead, and I had a pretty good fit. Using high grade metal based filler I then packed the inside of the base and ankles. 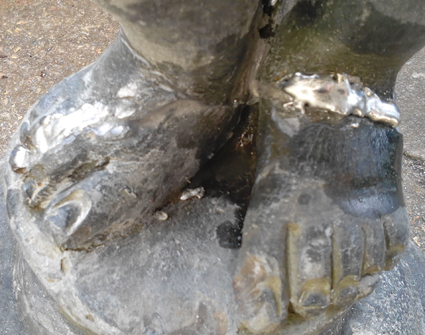 This gave the base back its strength of form and anchored the statue to the core steel rods I had inserted. 2 hours later and it had set solid. It was now a statue standing proud, but it needed lead work to close the join. This is where my leaded glass experience (and tools) came in. 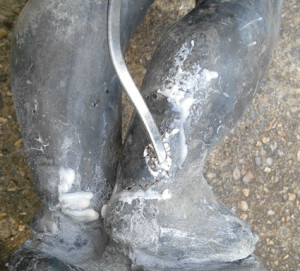 Below you can see the process of rubbing back the damaged lead to some form of clean lead base, adding pure lead solder and finally rubbing back to a smooth surface. 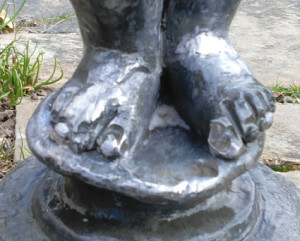 This was repeated around the foot and base in layers. The final stage was to add a blackening compound. 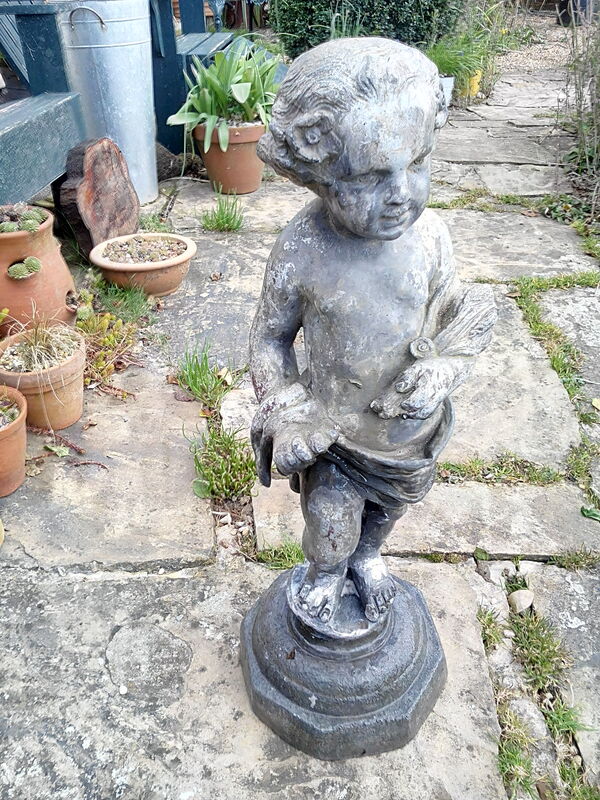 It is used in leaded glass work to darken new lead to match it to existing oxidized leading. And so it is finished. 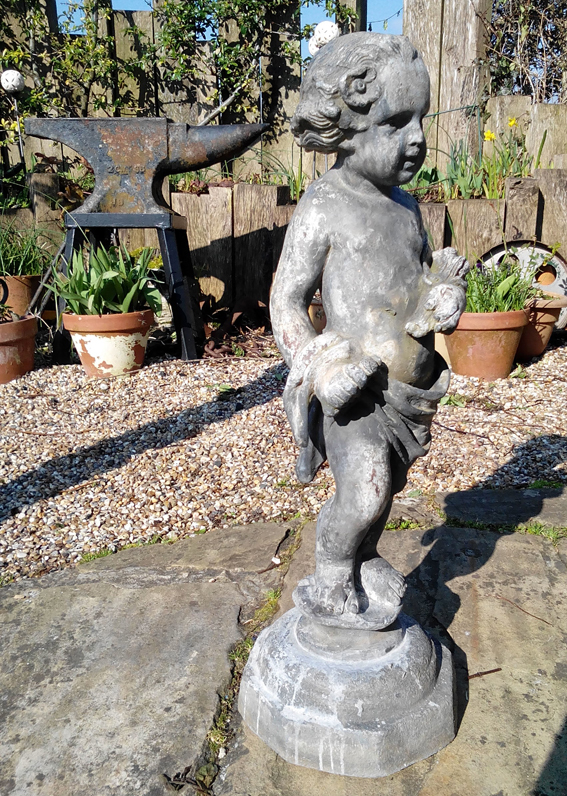 Look closely and you can see the join, but given how fragile and damaged the lead was, I am pleased with the final result. As a little break from the glass work (behind the scenes the glass casting continues, more in a while) I have been working on a wood carved house sign. 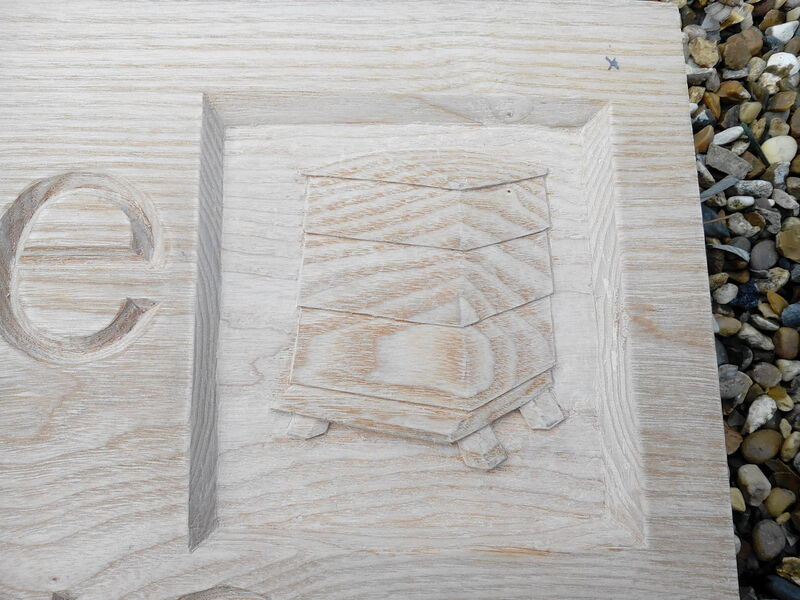 It is my first attempt at letter carving and, whilst enjoyable, I have found it a little constraining compared to my usual free flowing style. 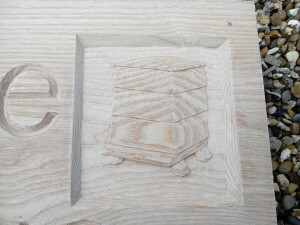 Included in the corner of the sign is a relief beehive, pictured here. I am still trying to decide how to finish the sign: simple oil, gold leaf inside the lettering or painted lettering. Whichever way I go it is a one time decision, so I am taking my time and looking for some similar examples, so that I can see the reality of how it looks. 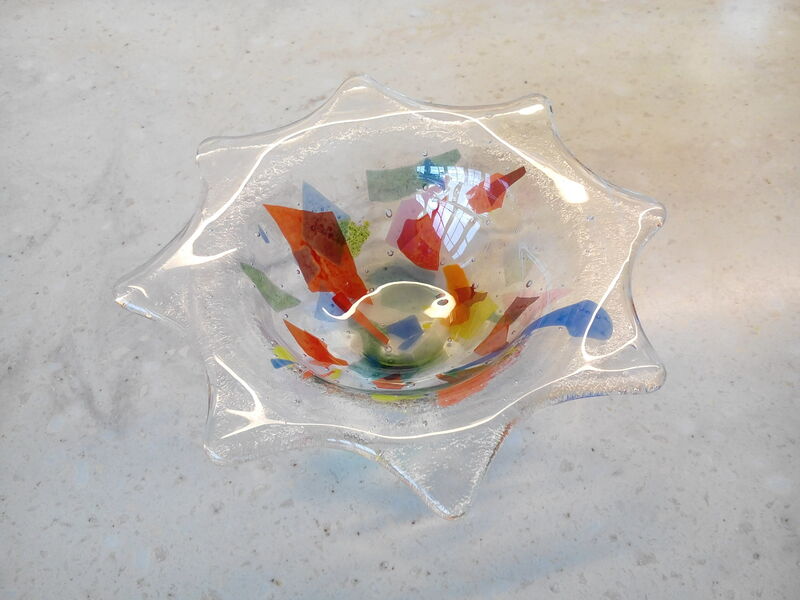 What more could you want other than to play with fused glass on a cold day? I have made my first deep slumping mould, to make a simple tea light holder, and I have to say it all worked quite well. The piece is made from 2 square sheets, offset, and with confetti glass sandwiched between them. I first fired it on a regular fusing programme to make the flat design. For the slumping stage I made a simple mould from vermiculite sheet, with a hole in it, to allow the glass to fall. I also used the kiln space to slump the ‘bubble’ sheet I made a few weeks ago into a dish. Some of the bubbles are a little larger than I would ideally like, but it is an interesting design that I will play with again. What next? Well watch this space, as, inspired by our holiday in South Africa and the principle of ‘leave only footsteps’, I am currently having a go with casting glass. I have been researching mould making and have all necessary bits and pieces. All I need now is time.